Blogger Seth Godin in a recent posting indicated that he believes there are only two reasons people aren’t paid more than their current salary – 1) People don’t know what they are worth or 2) The person isn't worth as much as they think they are. If Godin were to apply this concept to becoming an athletic director, he might suggest there are really only two reasons you haven't become an AD yet – 1) People don’t know that you are ready to be an AD, or 2) You aren't (currently) ready to be an AD as much as you believe you are. But I would add a third reason - you may not be the fit that a particular institution is seeking. So how do you overcome these issues? I had breakfast recently with Boston Celtics Assistant Coach Kevin Eastman who suggested a great concept - "separators". You need to create separators - specific things that distinguish you from the competition - to move up in your career. There are many, many talented people who are striving to become athletic directors from undergraduate students to senior associate athletic directors. Focusing on daily responsibilities and doing them well is crucial, but going beyond those responsibilities is even more important. Clearly establishing a personal brand – whether by serving on NCAA committees, being visible in conference meetings, or publicly sharing your views via social media in ways that are helpful can be separators. These activities force you to think and be open to criticism from the outside. When you say something publicly it more clearly defines who you are. Being able to articulate your views is necessary as an AD and is something you must be prepared to do when interviewing to become an AD. Carve a niche, and make your brand relevant – but not relevant to everyone, because that isn't possible. Explain who you are and what you stand for and this will help you find the ubiquitous yet illusive “fit”. Your beliefs are your brand. And don't compromise those things just to get the job. 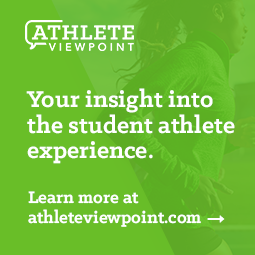 Conscious and purposeful expression about your view of intercollegiate athletics can be a separator. Start today. The investments you make now may pay the biggest dividends later and provide the separator that lands you that next opportunity.